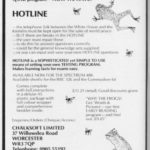 A short entry for now until we find out some more, but this was a quiz game that was mentioned in a German C64 magazine called Aktueler Software Markt – where the title Hotline Quiz was announced by Chalksoft Ltd. Although it seems the Spectrum version had got a release – the C64 version is very much at large. We don’t currently know if the game was actually started at all, or if the title is just vapourware. Well, the advert that was printed in some magazines suggest that the C64 and BBC micro editions were due soon, so maybe it was started? If you know anything more about the game, please let us know!